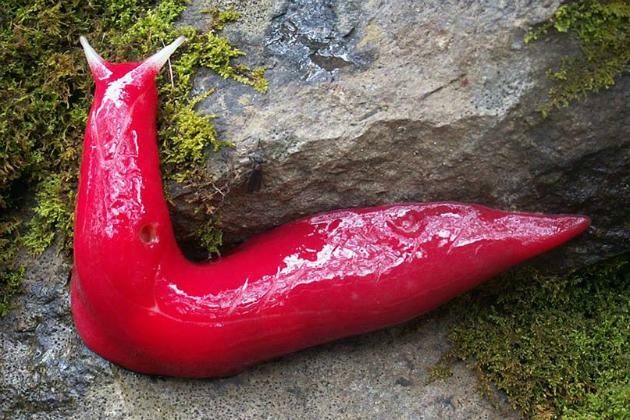 It would seem to be something you'd see only in a cartoon or at a Phish concert, but according to park rangers in New South Wales, Australia, dozens of giant, fluorescent pink slugs have been popping up on a mountaintop there. "As bright pink as you can imagine, that's how pink they are," Michael Murphy, a ranger with the National Parks and Wildlife Service, told the Australian Broadcasting Corporation. "On a good morning, you can walk around and see hundreds of them." The eight-inch creatures have been spotted only on Mount Kaputar, a 5,000-foot peak in the Nandewar Range in northern New South Wales. Scientists believe the eye-catching organisms are survivors from an era when Australia was home to rainforests. A series of volcanoes, millions of years of erosion and other geological changes "have carved a dramatic landscape at Mount Kaputar," the park service wrote on its Facebook page, and unique arid conditions spared the slugs from extinction. They "probably would have long since vanished, if a volcano had not erupted at Mount Kaputar about 17 million years ago," Ben Cubby wrote in the Sydney Morning Herald. "The result of that eruption is a high-altitude haven for invertebrates and plant species that have been isolated for millions of years, after Australia dried out and the rainforests receded." And they're not the only unusual inhabitants on the mountain. "We've actually got three species of cannibal snail on Mount Kaputar, and they're voracious little fellas," Murphy said. "They hunt around on the forest floor to pick up the slime trail of another snail, then hunt it down and gobble it up."